Hypertufa is a type of artificial stone made by mixing sand, cement and peat moss or other organic matter. It is commonly used for planters, birdbaths and other garden ornaments because it weathers well and is easy to move around. Molding hypertufa is straightforward, but like any concrete, it can take quite a while to cure. But if you invest time and effort in prolonged curing, you'll have an attractive garden ornament that will last for years. Lay the plastic sheet out on a floor that's out of direct sunlight (such as a garage floor). Place the larger of the two coated cardboard boxes in the center of the plastic sheet. The sheet should be at least 1 foot longer and wider than the box. The smaller cardboard box should be about 2 1/2 inches shorter and narrower than the other box. Pile up bricks or blocks around the outside of the large box. This is to prevent the box from sagging outward under the weight of the hypertufa. Put on your rubber gloves and mix 1 part Portland cement, 1 part sand and 2 parts peat moss in the wheelbarrow. Add enough water to make a mix that is easy to work with but is not runny. Place enough of the hypertufa mix in the bottom of the box to fill it to about 2 inches deep. Then place the four pieces of PVC pipe in a square pattern in the hypertufa layer. Set the smaller cardboard box on top of the pipe pieces, so it is centered. 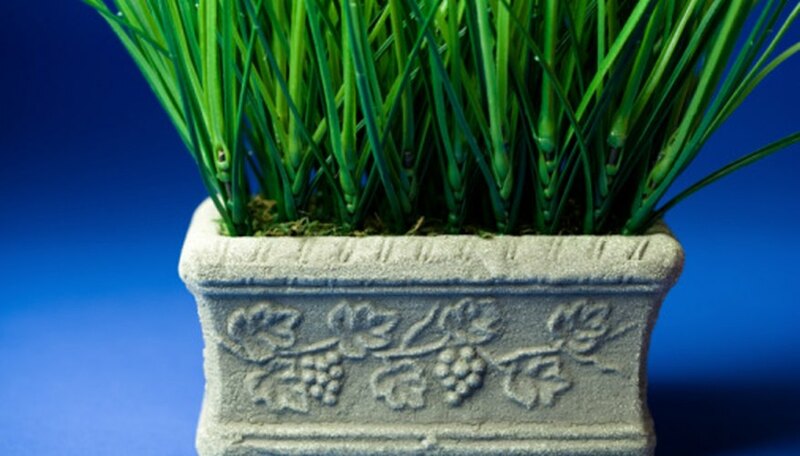 Fill the smaller box with soil or other heavy, loose material such as pebbles or sand. This prevents the smaller box from collapsing under the weight of the hypertufa. Fill the space between the larger and the smaller box with hypertufa. Stop occasionally to tamp the hypertufa mix down with a stick or trowel blade, to avoid leaving gaps or air bubbles. Allow the hypertufa to set for at least 24 hours. Remove the filling from the center box, then peel the inner cardboard out of the center of the hypertufa mold. Remove the blocks or bricks and peel away the outside cardboard. Be very careful not to move the mold, which will still be damp and not fully hardened. Use a wire brush to give the exterior of the mold a course, textured look. Spray the mold lightly with water. Allow the hypertufa to cure for at least a week, spraying lightly with water each day to keep the surface damp.